3Institute of General and Physical Chemistry, Studentski trg 12-16, 11000 Belgrade, Serbia. 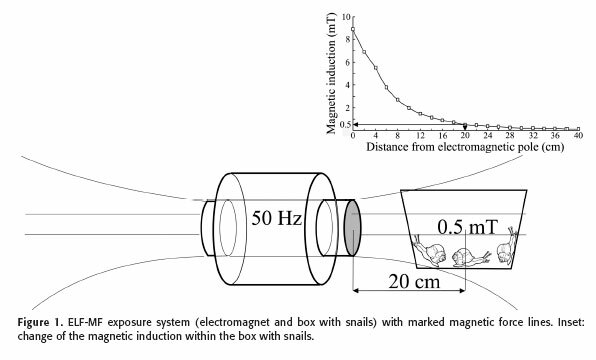 The effect of extremely low frequency magnetic felds (50 Hz, 0.5 mT) - ELF-MF, on phosphate metabolism has been studied in the isolated ganglions of the garden snail Helix pomatia, after 7 and 16 days of snail exposure to ELF-MF. The infuence of ELF-MF on the level of phosphate compounds and intracellular pH was monitored by 31P NMR spectroscopy. Furthermore, the activity of enzymes involved in phosphate turnover, total ATPases, Na+/K+-ATPase and acid phosphatase has been measured. The exposure of snails to the ELF-MF for the period of 7 days shifted intracellular pH toward more alkaline conditions, and increased the activity of investigated enzymes. Prolonged exposure to the ELF-MF for the period of 16 days caused a decrease of PCr and ATP levels and decreased enzyme activity, compared to the 7-day treatment group. Our results can be explained in terms of: 1. increase in phosphate turnover by exposure to the ELF-MF for the period of 7 days, and 2. adaptation of phosphate metabolism in the nervous system of snails to prolonged ELF-MF exposure. Key terms: ELF-MF, garden snail, 31P NMR spectroscopy, phosphate turnover enzymes. In recent decades scientific interest in the effect of static and alternating magnetic fields on the biological systems has increased. Various strengths of magnetic felds are investigated for their biological effects, but mostly at the strength of the Earth's magnetic feld (35 - 70 µT) and, much higher, man-made magnetic felds that are normally present in our environment. This interest arises from the fact that all living organisms are constantly exposed to the Earth's and man-made magnetic felds (Table 1). The ability of biological systems to detect the Earth''s magnetic field is found in diverse invertebrates and vertebrates and is important for compass orientation of animals (Katz and Yilks, 1979; Mather and Baker, 1981; Zoeger et al., 1981; Blakemore, 1982; Mathis and Moore, 1984; Lohman and Willows, 1991; Wang et al., 2002). Furthermore, numerous studies have explored the interaction of man-made static and alternating magnetic fields with biological systems. Previous research showed that these magnetic felds can induce changes in behavior (Rudolph et al., 1985; Prato et al., 1996; Janac et al., 2005), enzyme activity (Nossol et al, 1993; Blank and Soo, 1996; Liboff et al., 2003; Chen et al., 2009), the synthesis and release of neurohormons (Peric-Mataruga et al., 2008), biophysical properties of neurons (McLean et al., 1995; Calvo and Azanza, 1999; Ye et al., 2004; Todorovic et al., 2007), synaptic transmission (Rosen, 1992) and ion channel currents (Shen et al., 2007). Furthermore, magnetic field infuence on nucleic acids and protein synthesis has been found (Cridland et al., 1999; Ciombor et al., 2002; Hirai et al., 2002; Schmitz et al., 2004). However, little is known about magnetic feld effect on the phosphate metabolism of the nervous system. In order to test the effect of magnetic felds on nervous system metabolism, we chose the nervous system of the snail Helix pomatia, which is a well-described model system for neurophysiological studies (Rozsa 1984, Altrup 2004). As we have already shown, neuronal membrane properties of Helix pomatia are infuenced by static magnetic fields (Nikolic et al., 2008). Other studies have documented that magnetic felds induce changes in the bioelectric properties of snail neurons (Balaban et al., 1990; Moghadam et al., 2008; Ayrapetyan et al., 2004). As is known, the fring properties of neurons and electrical signaling between cells imply specifc energy demands (Magistretti, 2003). 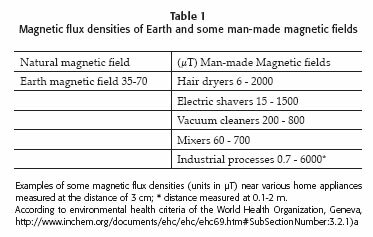 Furthermore, maintenance of the electrochemical gradient, Examples of some magnetic fux densities (units in µT) near various home appliances measured at the distance of 3 cm; * distance measured at 0.1-2 m.
According to environmental health criteria of the World Health Organization, Geneva, http://www.inchem.org/documents/ehc/ehc/ehc69.htm#SubSectionNumber:3.2.1)a particularly for Na+ and K+ ions by Na+/K+-ATPase, is the main energy consuming process in neuronal cells. Moreover, the energy status of the cell infuences bioelectrical properties of the membrane (Lara et al., 1999). We wanted to test whether magnetic felds of extremely low frequency (50 Hz) and of a magnetic fux density of 0.5 mT (ELF-MF) would have effects on the nervous system metabolism of H. pomatia. As can be seen from Table 1, alternating magnetic felds of similar strength can be encountered in the vicinity of various home appliances. In order to explore whether exposure to ELF-MF can cause changes in the level of phosphate compounds in the nervous system of the snail, we used the 31P NMR spectroscopy, which provides direct information about tissue energy metabolism and indirect data from intermediary metabolism. To investigate ELF-MF infuence in more detail, some of the enzymes involved in phosphate (P) turnover were also explored. So far, several reports about magnetic feld infuence on the activity of enzymes involved in P turnover have been reported (Blank and Soo, 1996; Chen et al., 2009). We have chosen to explore the total ATPases, Na+/K+-ATPase and acid phosphatase enzymes in the snail nervous system. The 31P NMR and enzyme activity analysis were performed on the isolated ganglion complex of the garden snail Helix pomatia (Pulmonata: Helicidae). Snails used for all experiments were collected at spring, placed in polycarbonate boxes and kept in the cold chamber at 7 °C. The experiments were conducted in the winter period, because snail activity and variations in snail physiology, as seen by variations in the texture and rigidity of connective sheets, are minimal in the winter months. In this way the effects of seasonal changes in snail physiology are greatly minimized. Four weeks prior to the experiments, snails were acclimated at 22 °C, kept in an active state, and fed regularly. An experimental group composed of randomly selected snails of similar age (with a shell diameter of approximately 4 cm) was placed in a polycarbonate box (26 cm wide x 43 cm long x 15 cm high) in a temperature controlled room (22 ± 1 °C) and exposed to the ELF-MF as shown in Figure 1. For the purpose of 31P NMR analysis, the single group of snails (n = 20) was exposed to the ELF-MF. After 7 days of exposure, 10 randomly selected snails were used for recording NMR spectrum, another 10 snails were further exposed to the ELF-MF up to 16 days, and another NMR spectrum was recorded. Immediately afterwards, a control group was formed by placing 8 snails at the same position as the exposed group, but the source of ELF-MF was turned off and unplugged from its power supply (sham exposure) for 7 days, after which the control NMR spectrum was recorded. A similar procedure was used for biochemical analysis. The only difference was the number of snails: 3 animals out of group of 7 snails were used for enzyme activity analysis after 7 days of ELF-MF exposure, and the remaining 4 snails were used for enzyme activity analysis after 16 days. The control group (n = 5), placed at the same position as the ELF-MF treated group, was sham exposed for a period of 7 days, immediately after the 16-day treatment. Ganglion complexes were isolated as previously described in Nikolic et al (2008). Briefy, after the snail foot was separated, it was pinned onto a cork plate in the extended position. Incision at the dorsal anterior surface of the snail's foot enabled access to the ganglion complex. In order to prevent tissue degradation, the isolated ganglions were kept in snail physiological solution on ice prior to measurements. The source of ELF-MF was placed approximately 20 cm from the center of the box with snails (Fig. 1). Alternating magnetic fields were generated by a solenoid-type electromagnet with a regular laminated transformer core and pole dimensions of 9.5 cm × 9.5 cm. A 50 Hz sinusoidal current (40 V, 4.5 A) was passed through the magnet. The alternating magnetic feld was not uniform in the exposure space (Fig. 1), but an average magnetic induction was 0.5 mT at the middle of the polycarbonate box, a value in the magnitude found in the vicinity of home appliances (Table1) (measured by a Hirst GM05 Gaussmeter, using a PT2837 probe). The temperature difference between ELF-MF treated and sham exposed groups, in the exposure space, was less than 0.3 °C measured in the air, and no difference was found measured in the liquid. Magnetic force lines were parallel to the horizontal component of the local geomagnetic feld. Earth magnetic feld strength, measured by a GSM 10 proton magnetometer (Geomagnetic Institute - Grocka, Belgrade), was within the normal range throughout experiments in the area of study (44°38' N, 20°46' E). The background magnetic feld did not exceed the value of 10-5 mT. Exposure time was chosen based on the previous experiments, showing that a 0.5 mT alternating magnetic feld can induce behavioral effects, as well as biochemical changes in the brains of rats exposed for as little as 7 days (Janać et al., 2005; Jelenković et al., 2006). 31P NMR measurements were performed using a Bruker MSL 400 (Germany), Apollo upgraded (Tecmag, USA) spectrometer operating at 161.978 MHz for 31P. The other experimental conditions were: 15 µs pulse width (45°), relaxation delay of 300 ms, 8 KHz spectral width. Under such conditions, peaks are partially saturated, however, data were analyzed only in terms of relative changes and there are no reasons to assume that the relaxation times of different components change. Each spectrum represents 4000 acquisitions averaged over 20 minutes. The line broadening of 25 Hz was applied with Fourier transformation. The isolated snail ganglions (about 5.8 g) were packed in the 10 mm NMR tube filled with physiological snail solution (80 mM NaCl, 5 mM MgCl2, 10 mM CaCl2, 4 mM KCl, and 5 mM Tris (hydroxymethyl) aminomethane. Capillary with methylenediphosphonate, MDP (25 mM) was used as an external chemical shift (17.05 ppm relatively to 85% H3PO4) and peak intensity standard. It should be mentioned that during experiments there were no changes in the chemical shift and line width of the MDP reference signal, which is in agreement with reported independence of these parameters on the magnetic susceptibility of the solution in the outer tube under similar experimental conditions (Fabry and San George, 1983). All chemicals used for 31P NMR spectroscopy were supplied from Merck (Germany). The 31P NMR spectra for the control and 7-day and 16-day ELF-MF exposed groups of snails were obtained from 8 to 10 ganglions, and represent average status of the ganglions used. Intracellular pH value was estimated according to Mimura and Kirino (1984). Analysis of enzyme activity was performed on isolated, individual snail ganglions. Each ganglion with a weight of approximately 61 mg was analyzed in triplicate. Ganglion tissue was homogenized in 0.7 mL Tris-HCl buffer at pH of 7.4 with 0.01% Triton X-100. The homogenate was centrifuged in refrigerated in an Eppendorf microcentrifuge, model 5415R, at 10000 rpm. The supernatant was used for enzyme activity measurements. Protein content was determined by the method of Bradford using BSA as standard proteins (Bradford, 1976). The activity of investigated enzymes was measured using a Shimadzu UV-2501 PC spectrophotometer (Shimadzu Scientific Instruments, Japan). ATPase activity was determined by measuring ATP decomposition to inorganic phosphate and ADP. Three reaction mixtures were set, one experimental and two controls. The reaction was started by adding 70 µg of total proteins from isolated ganglions into the fnal volume of the reaction mixture. The experimental reaction mixture contained: 40 mM KCl, 10 mM ATPMg, 10 mM MgCl2, 240 mM NaCl, and 25 mM Tris-Cl buffered at pH 7.4. First the control experiment was performed with the addition of 2 mM ouabain and without KCl, and the control experiment was performed without ATPMg. The reaction mixture was incubated at 22 °C for one hour and the reaction was stopped by adding SDS to a final concentration of 1%. Inorganic phosphate was quantifed by the method of Ohnishi et al. (1975) modifed for microplate reader. The activity of ATPases was obtained as follows: the total ATPases were calculated by subtracting the probe absorbance from the total ATPases absorbance; by subtraction of the ouabain insensitive absorbance values from the total ATPases we obtained ouabain sensitive ATPases (Na+/K+-ATPase). Acid phosphatase activity was measured by the rate of p-nitrophenyl phosphate hydrolysis for 5 minutes by following absorbance at 405 nm. The reaction was started by adding 200 mg of total protein from isolated ganglions in the fnal volume of reaction mixture. The reaction mixture contained 10 mM acetate buffer (pH 5.5), 1 mM MgCl2, and 5 mM p-nitrophenyl phosphate. The p-nitrophenol concentrations were estimated by using extinction coeffcient 18.5 cm2/µmol. All chemicals used for enzyme essays were supplied from Merck (Germany). In data analysis, the results of the control group of snails (7-day sham exposed) were compared to the results of 7-day treatment group. In order to monitor the effect of the ELF-MF for a longer period, the 16-day treatment group was compared to the group of snails treated for 7 days. Intensity of each 31P NMR signal was calculated by NTNMR software (Tecmag, USA), and normalized to the intensity of the MDP signal. The errors of measurements were calculated as absolute errors. The error Di of normalized signal intensities Ri was calculated as Di = Ri * ((a / MDP intensity) + (a / signal intensity)), where a is the amplitude of noise, measured as Ω peak to peak, and Ri is the signal intensity/ MDP intensity. We considered that 31P NMR spectra normalized intensity values between compared groups were different if the sum of absolute errors was smaller than the difference between the intensities measured. The differences in the enzyme activity (mmol/ mg´min) were evaluated by a one-way ANOVA (followed by Fisher LSD test). The significance was set at *p < 0.05, **p < 0.01, and ***p < 0.001. Error bars represent the standard error of the mean (SEM). 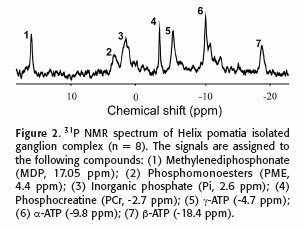 The 31P NMR spectrum of the isolated ganglion complex of the Helix pomatia snail is presented in Figure 2 and, to the best of our knowledge; this is the first recorded spectrum of the snail nervous system. Therefore, assignment of spectra signals was made by comparison to previously reported 31P NMR spectra of the nervous systems of other species (Kauppinen and Williams, 1994; McNamara et al., 1994; Tsuji et al., 1995; Buck et al., 1998; Tsao et al., 1999). Obtained spectrum consists of signals that were assigned, from downfield, to: phosphomonoesters (PME), inorganic phosphate (Pi), energy storage compound phosphocreatinin (PCr), and nucleotide phosphates (a, 13, y-ATP) involved in energy metabolism. The phosphomonoester peak consists mainly of phosphorylethanolamine (PE), with a smaller contribution from phosphorylcholine (PC). The spectra of ganglion complexes for the control and 7-day and 16-day ELF-MF exposed snails are presented in Figure 3A, while quantitative representation is presented in Figure 3B. As can be seen from the Figure 3B, the changes in the normalized intensities of phosphate compounds were not found between the control and the 7-day ELF-MF exposed group of snails (white and black bars). The important difference, between signals from the ganglions of control and 7-day ELF-MF exposed snails was the change in the chemical shift of the Pj signal which is commonly used as an indicator of intracellular pH changes (Kauppinen and Williams, 1994) indicating intracellular pH change toward alkaline conditions, from about 6.9 to 7.1 in the 7-day ELF-MF exposed snails (Fig. 3A, vertical line). However, when we compared the normalized signal intensities of the 7- and 16-day treatment groups (Fig. 3B, black and gray bars), the decrease in the intensity of the PCr and the ATP signals in the 16-day exposed group of snails was found. The intensity of the p-ATP signal was used for monitoring the energy status (ATP content), since y and a ATP signals overlap considerably with the p and a resonance of ADP (Stubbs et al., 1996). To further explore the infuence of ELF-MF on the phosphate metabolism of the snail nervous system we investigated the activity of enzymes: total ATPases, Na+/K+-ATPase, and acid phosphatase. The results presented in Figure 4 show that the activity of total ATPases signifcantly increased (p < 0.01, n = 3) in the 7-day treatment group of snails (19.4x10-6 ± 8.4x10-6 mmol/mgxmin) compared to the control group (2.1x10-6 ± 0.5x10-6 mmol/mgxmin). However, in the 16-day treatment group the signifcant decrease (p < 0.05, n = 4) in the activity of total ATPases (6.1x10-6 ± 2x10-6 mmol/mgxmin) compared to the 7-day treatment group was found. As well, Figure 4 shows the significant increase (p < 0.05, n = 3) in the specifc activity of Na+/K+-ATPase in the 7-day treatment group (9.5x10-6 ± 5 x10-6 mmol/mg×min) compared to the control group of snails (1.2x10-6 ± 0.4x10-6 mmol/mg×min). The difference between 7- and 16-day treatment groups of snails was not signifcant. 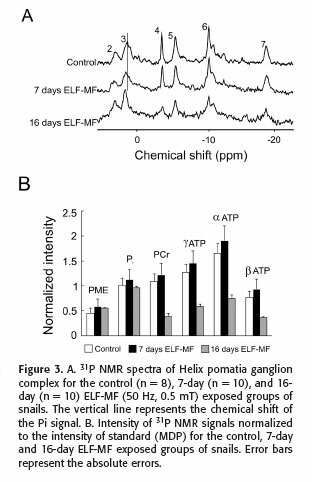 The Na+/K+-ATPase activity in the 16-day ELF-MF exposed group of snails was 2.2x10-6 ± 0.6x10-6 mmol/mg×min. We also calculated Na+/K+-ATPase fraction in total ATPases for the control and exposed groups of snails. The difference between the values for the control (0.6 ± 0.1), 7-day treated group (0.5 ± 0.1) and the 16-day ELF-MF treated snails (0.4 ± 0.1) is not signifcant. Figure 4, 5 Effect of the tested ELF-MF on the specifc activity of the acid phosphatase is presented in Figure 5. ELF-MF applied for 7 days caused a signifcant increase (p < 0.001, n = 3) in the activity of acid phosphatase (6.8x10-7 ± 1.3x10-7 mmol/ mg×min) compared to the control group of snails (0.5x10-7 ± 2.5x10-9 mmol/mg×min). A statistically signifcant decrease in acid phosphatase activity was found in the 16-day exposed group (3.9x10-7 ± 1x10-7 mmol/mg×min) compared to the 7-day exposed group of snails (p < 0.05, n = 4). In the present work, performed on Helix pomatia isolated ganglions, we showed that exposure of snails to the ELF-MF for a period of 7 days increased intracellular pH value and caused changes in the activity of the total ATPases, Na+/K+-ATPase and acid phosphatase, enzymes involved in phosphate turnover. Another important fnding of our research is the difference between the effect of 7 and 16 days of ELF-MF exposure on snail phosphate metabolism. The level of phosphate compounds, PCr and ATP, as well as the activity of investigated enzymes, decreased in the16-day treatment group of snails, compared to the 7-day treatment group. Two alternative explanations can be proposed for the obtained 31P NMR spectrum of ganglia from the 7-day treatment group of snails. The frst is that the tested ELF-MF did not cause changes in the metabolism of identified phosphate compounds in the snail nervous system. As can be seen from Figure 3, we did not fnd prominent changes in the intensities of PME, Pi, PCr and ATP signals. The second explanation of the apparent lack of change in the 31P NMR spectrum of snail ganglia after exposure to ELF-MF for 7 days is that an increase in both synthesis and the degradation of phosphate compounds occurred. We fnd the second explanation more plausible, since the increase in the activity of total ATPases and Na+/K+-ATPase, as found in the 7-day treatment group, should result in a decrease of ATP signal intensity, and we did not detect this by 31P NMR. We interpret this fnding as an indicator that metabolic pathways involved in the synthesis of ATP increased in the ganglia from the 7-day treatment group. Furthermore, the detected increase of acid phosphatase activity, involved in the processes of catabolism (Hollander, 1971), in the 7-day ELF-MF treatment group of snails indicates that the processes of catabolism of phosphate compounds in the snail nervous system increased. A longer period of magnetic field exposure, according to our 31P NMR data, decreased the level of energy source compounds ATP and PCr. Depressed ATP levels were also reported in experiments where rat brains were subjected to low frequency microwaves (Sanders et al., 1980; Sanders and Joines, 1984) and in the experiments with 60 Hz sinusoidal magnetic feld on Physarum amoeba (Marron et al., 1986). Overall, our data suggest that magnetic felds probably cause a transient increase in the activity of enzymes involved in the synthesis of ATP, followed by the decrease in their activity with prolonged exposure. 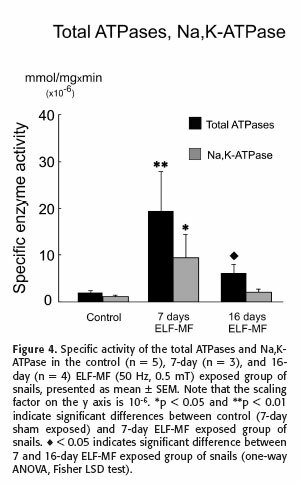 The increase of the Na+/K+-ATPase activity, which we found after exposure to ELF-MF in vivo, is in agreement with the results of the ELF-MF effect on the Na+/K+-ATPase activity obtained on the isolated enzyme preparations. The in vitro effect of 60 Hz magnetic feld was reported for the Na+/ K+-ATPase containing vesicles prepared from frozen rabbit kidneys (Blank and Soo, 1996). The increase in the activity of Na+/K+-ATPase, found in both, in vivo and in vitro research, indicates that ELF-MF interactions with biological systems as refected in this enzyme activity might be at the protein level. Recent research showed that the 0.5 mT 60 Hz magnetic field can increase the activity of F0F1-ATPase in chromatophores prepared from the cells of bacteria Rhodospirillum rubrum (Chen et al., 2009). The F0F1-ATPase is also present in the inner membrane of eukaryotic mitochondria. To what extent this mitochondrial level of the ELF-MF-biological system interaction has a determining role in the complex phenomena whose net results we measured, needs to be further explored. The prominent decrease after 16 days exposure at the level of PCr, which serves as the source of ATP (Mellergard and Siesjo, 1998) suggests that long exposure most probably affected an energy demanding cellular processes, such as gene transcription and protein synthesis. Therefore, the possibility of magnetic feld-biological system interaction on the gene level should not be excluded. We found that with longer exposure to ELF-MF in comparison to 7 days ELF-MF treatment there was a signifcant decrease in the activity of total ATPases and acid phosphatase. Even though it seems that some compensatory mechanism is in place, it is hard to say what levels and mechanisms of the regulation of enzyme activity are involved. Although it is quite possible that long term effects of ELF-MF exposure involve some gene transcription and translation changes that was not the object of our present study. 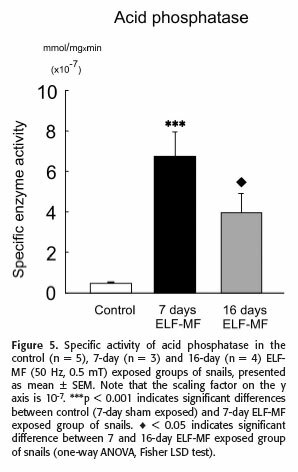 Finally, on the basis of the results obtained, we propose that exposure to the ELF-MF for the period of 7 days increased the overall phosphate turnover in the snail nervous system, while after prolonged ELF-MF exposure phosphate metabolism adjusted to the tested ELF-MF by reaching a balance at the new level. Most probably, more than one level of magnetic field-biological system interaction is involved in the detected perturbations of the phosphate metabolism. Several aspects of nervous system energy status after exposure to ELF-MF in vivo were measured in this study. The results presented here, to our knowledge, are the first description of the ELF-MF infuence on the phosphate metabolism in the nervous system of Helix pomatia. We have found that the magnetic feld induced an increase in the consumption of phosphate compounds and altered the activity of some enzymes involved in phosphate turnover. Together with in vitro conducted research, it could contribute to further understanding of the magnetic feld - biological systems interactions. This study was supported by the Ministry of Science and Technological Development, Republic of Serbia (Grants No. 143027 and 143016). The authors thank Dr. Branka Janać of the Institute of Biological Research "Sinia Stanković", Belgrade, for fruitful discussion during manuscript preparation. Received: November 11, 2009. In revised form: March 16, 2010. Accepted: April 6, 2010.